"Cloud-based, Technology Infrastructure Management Is Here!" 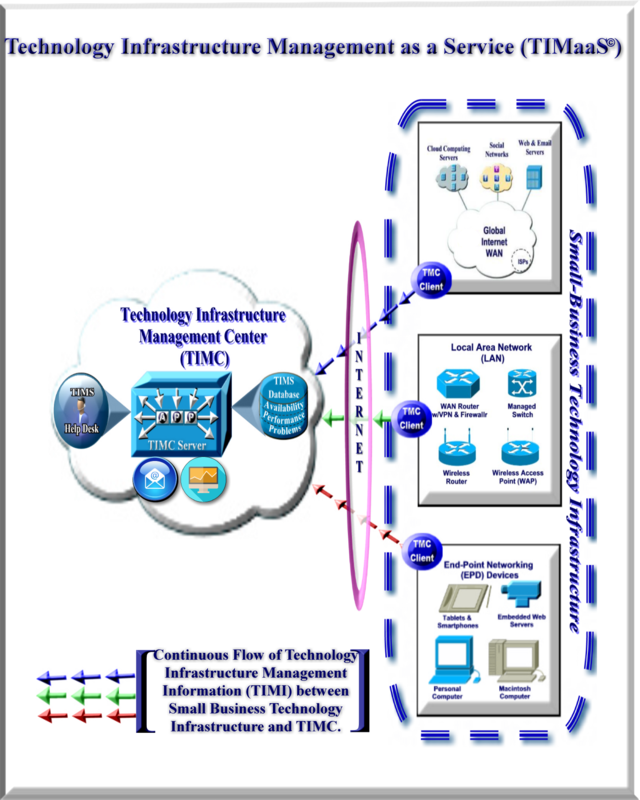 "A New Approach to Managing Technology Infrastructures"
For many years, the proverbial "MISSING LINK" within the Information Technology (IT) industry was an integrated management approach for managing Internet broadband connections that form the Wide Area Network (WAN). Now with the urgent requirement for small businesses to become Cloud-Compliant, the WAN is now the "central nervous system" of the business. During the past five years, the Internet has dramatically increased in both size and complexity, yet there has been no corresponding effort to ensure that the WAN connections that traverse this "network of networks" are reliable, available, and serviceable. To date, this has not been a critical issue to small businesses, but the migration to cloud computing makes it imperative that this portion of the small business technology infrastructure be managed on a continuous, 24/7 basis. TIMS does this by creating a "Management Dimesionn" for your enterprise LAN. One of the most important features of this management dimension, is that it creates and manages a Global Internet WAN that has many of the attributes and characteristics of a dedicate WAN. This new management "dimension" is easily added to any existing small-business enterprise LAN environment, and instantly transforms it into a managed, cloud-compliant technology infrastructure! This transformation requires no new hardware or software; and does not require any technical expertise at the customer's premise.